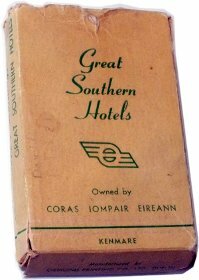 In January 1935 Waddington’s obtained a financial interest in Dublin by making a part acquisition of the Ormond Printing Company. 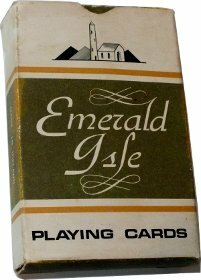 This enabled the firm to extend their activities in Ireland, particularly by manufacturing playing cards and cartons in Dublin. A new Ace of Spades was introduced, used with Waddington’s standard courts and jokers. Ross Castle dating from the fourteenth century, stands on a peninsula jutting into Killarney’s Lower Lake. These playing cards feature a painting of Ross Castle signed by travel artist Walter Till, and are presented in a green padded box with the Ormond Ace of Spades design printed on the lid above the legend Made in Ireland. The court cards and Joker are those used by Waddington’s at this time, with six of the courts unturned. 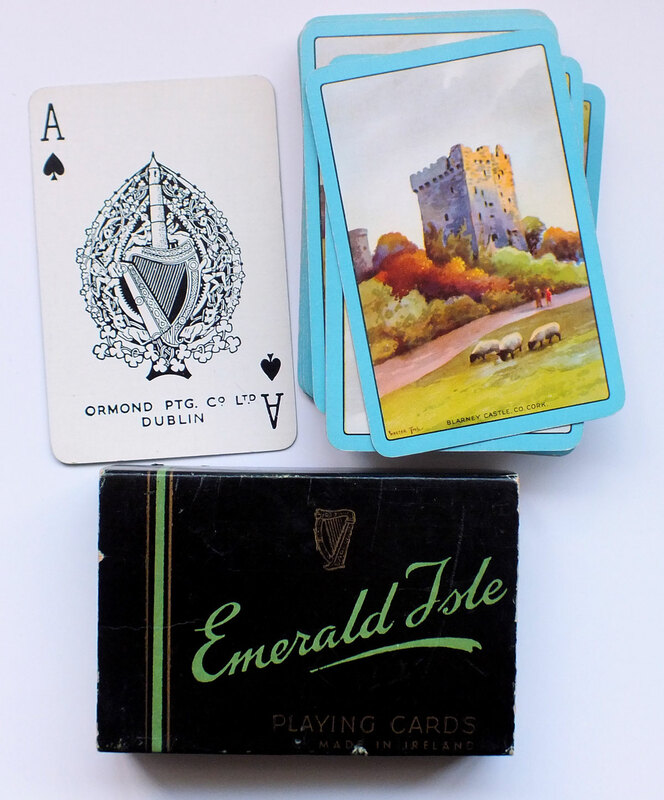 In the first example the cards feature an original painting of Blarney Castle, Co. Cork, with three sheep grazing in the foreground, signed by Walter Till. The court cards and Joker are the same as in the above example, with six of the courts unturned. The black box has a sliding inner tray. In the second example (c.1960) the box has been re-designed and the reverse shows a colour photograph of Glengarriff Harbour, Co. Cork. 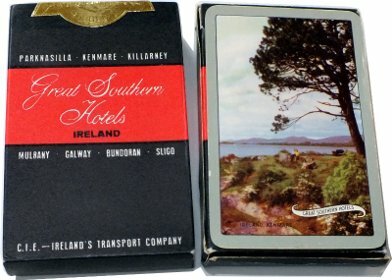 Other packs show Clifden, Co. Galway. 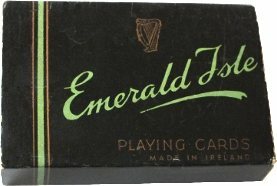 The court cards are those formerly used by Goodall & Son which by this time were being used by Waddingtons who printed these cards in their Irish subsidiary. 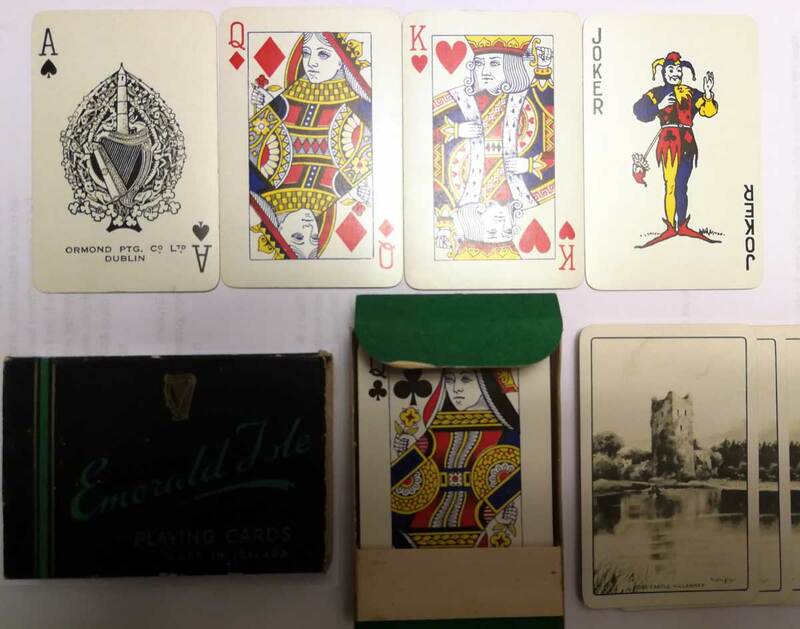 During the 1960s Waddington's discontinued using their own court card designs in favour of those of Goodall & Son, but retaining the same Joker and Ace of Spades. 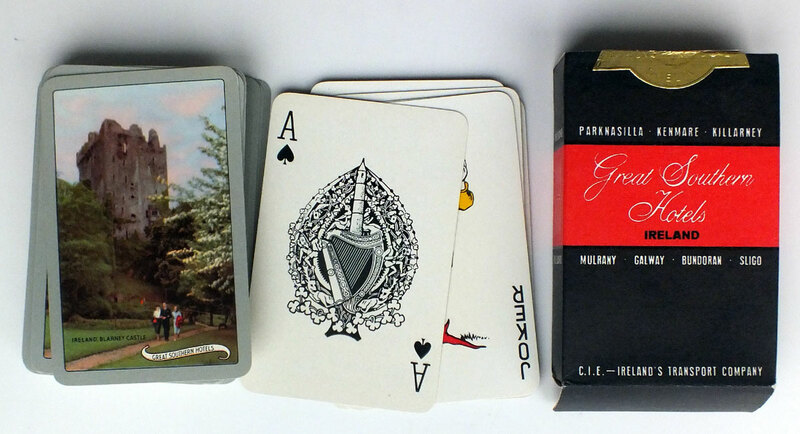 As a rule, two Aces of Spades were printed with each pack, one with the company name, the other without. Either the named or the anonymous Ace was used, probably depending on the clients' preference. The other Ace was often affixed to the box. 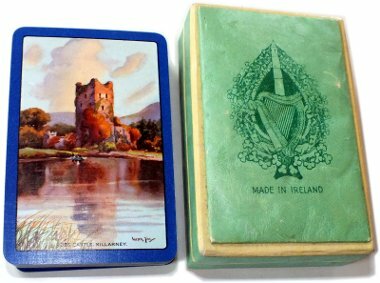 In the 1960s Emerald Isle series they also did cards with photographic scenes on the back of: "Trinity College, Dublin", "Custom House, Dublin", "Ross Castle" and "Bunratty Castle, Co Clare". 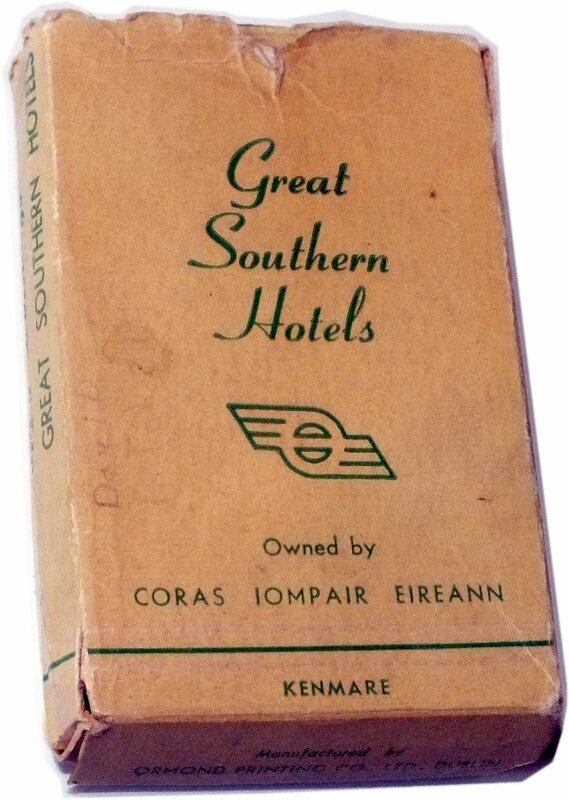 The first box lists the locations of Great Southern Hotels as: Parknasilla • Killarney • Kenmare • Galway • Mulrany • Sligo. Bundoran is added on the second box. 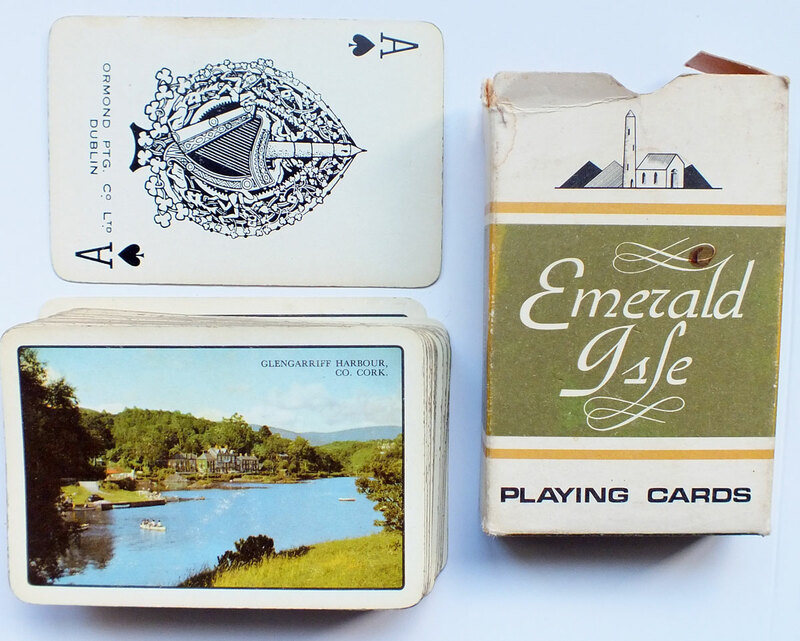 Both the examples shown here show a colour photograph of Kenmare on the reverse. The court cards and Joker are to begin with standard Waddington's designs with six of the courts ‘unturned’. Later, around 1970, the former Goodall & Son court cards are used. Advertising packs are also found with Ormond Printing Co Ace of Spades. Some Ormond Printing Co packs are found with an extra Guinness is good for you card inviting the holder to a guided tour of the brewery.